If it seems LED lighting is popping up everywhere these days, that’s because it is. Installation of A-type bulbs jumped 160 percent between 2014 and 2015, and those numbers continue to grow, according to the U.S. Department of Energy. Projections show that increased usage could save Americans nearly $630 billion in avoided energy costs between now and 2035. That’s because no other lighting technology has more energy-saving potential than LED lighting, also known as solid-state lighting (SSL). But SSL is just scratching the surface of what it can do. With just 5 percent of its energy-saving potential met, continued research by government and industry could help unlock even more savings. The National Academies of Sciences, Engineering, and Medicine recently released a report recommending that the U.S. Department of Energy continues its research and development efforts that address key technological challenges for high-efficiency SSL. Why? 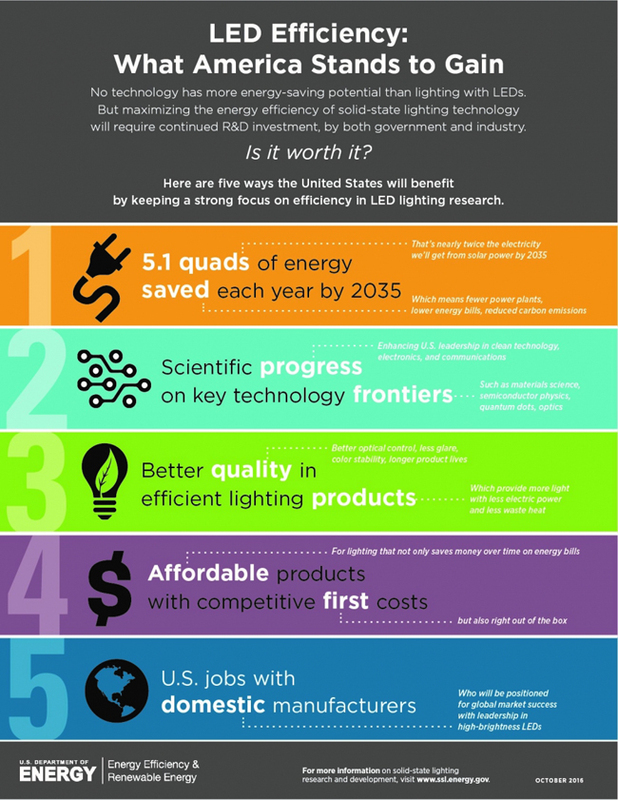 Because a strong focus on LED lighting research will benefit the country in these five compelling ways, as illustrated below.